Kim Possible flies into a mission in the first trailer for the upcoming live-action movie! Check out the trailer below as well as the synopsis for the film (via Deadline). Kim Possible was written by Josh Cagan (The Duff) and Bob Schooley & Mark McCorkle (Big Hero 6: The Series, The Penguins of Madagascar). "Premiering Friday, Feb. 15 (8/7c), the move begins with Kim and Ron beginning high school, "where Kim must navigate an intimidating new social hierarchy". Kim's day starts to turn around when she and Ron meet and befriend Athena (Ciara Wilson), a new classmate and Kim Possible superfan who is having an even worse day than Kim. With Kim's guidance and friendship, Athena transforms into the newest member of Team Possible. But Athena starts to eclipse Kim just as the nefarious Drakken and Shego resurface in Middleton with a dastardly plan to finally stop Kim. When she's not saving the world, Kim's an everyday high schooler, she's late for class and going toe-to-toe with her frenemy, Bonnie (Erika Tham). But who's got time for school when villains like Dr. Drakken (Todd Stashwick), Shego (Kim's evil clone played by Taylor Ortega), and Professor Dementor (Patton Oswalt) are on the loose? McCorkle and Schooley will also serve as Executive Producers along with Zanne Devine, whose producing credits include I, Tonya and Easy A. 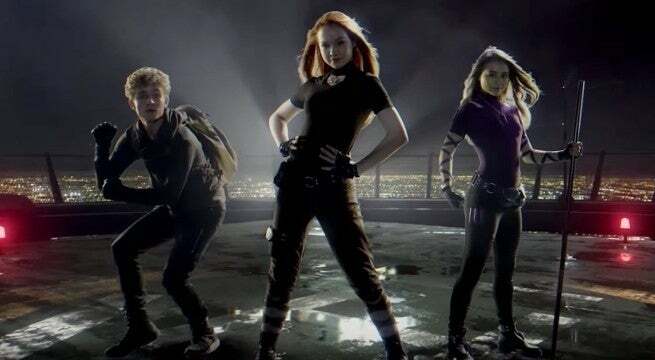 Even though Stanley's experience with acting is limited (her audition for Kim Possible was her first ever), she whizzes through the action-packed trailer like a pro, even nailing Kim Possible's amusing personality. The movie was co-directed and co-produced by Adam B. Stein and Zach Lipovsky (MECH X-4). The original animated series ran from 2002 to 2007 on the Disney Channel and was both a ratings hit and a critical and awards darling.